Ceramic Tile Distributors (CTD) supply all sectors of the tile market from their network of 84 shops situated throughout the UK. CTD Trade is focused on the needs of the customers, offering an extensive product portfolio, and prides itself on its unrivalled service level. With a large network of stores across the country, the company wanted a robust loyalty system that would fully engage with their trade customers. They approached Loyalty Pro as their existing scheme was limited in function and did not come with managed support. We built a bespoke loyalty scheme for CTD which they called ‘Get more for your money’ and provided each store with a tablet, tablet stand, printer hand-held barcode scanner, security equipment and 3G MIFI communications. The company required a number of bespoke features including additional fields to be added to the registration screen on the tablet and a signature strip on the card to allow trace account value to be written onto it. We created a special type of voucher to facilitate redemption via either CTD or Love2shop high street vouchers. Our system has been implemented in all 84 stores and the loyalty card is promoted on the trade page of their website. Sign up is quick and easy in store, with excellent back office support and remote control training in place. Customers get advance notice of offers and events as well as a point for every £1 they spend. Every time they reach 1000 points they receive a £10 voucher. Many customers save their points and spend them in one go at Christmas. Our system is so flexible that we can bolt on additional enhancements remotely. For example, we recently incorporated an extra bonus voucher for new card holders, made it possible for till transactions to be integrated using overnight processing, and can now offer card holders a monthly statement to their registered email address. In March 2016 we upgraded 40 CTD sites to 4G for even quicker response time and to allow CTD to use WiFi to connect additional devices, including their state-of-the-art tile ‘Visualiser’ system. Future plans include an interactive survey application to gather customer feedback via the tablet. 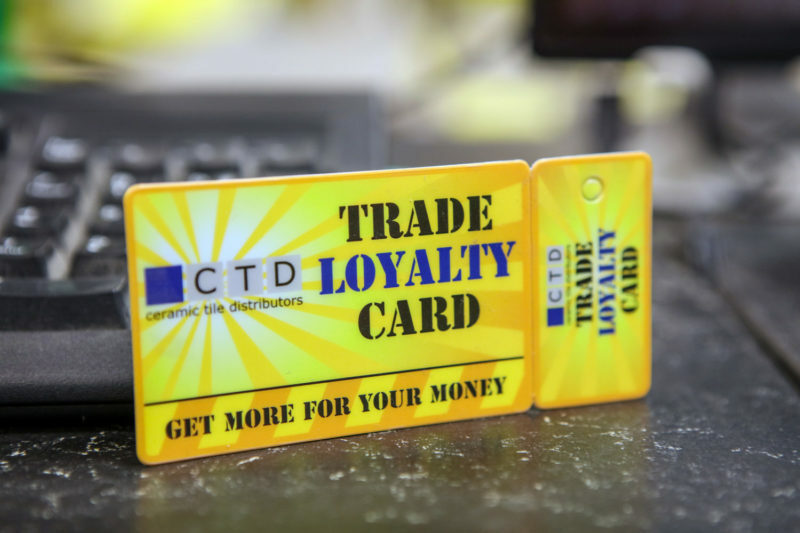 In the last 12 months (to May 2016) our loyalty system has processed more than 105,000 loyalty purchases for CTD with a value exceeding £10 million. Shirley Holland said: “Almost 60 per cent of our trade customers have our loyalty card and it’s a fantastic tool for us to keep in touch with them. We email them point statements and exclusive offers, and we’ve found that our open rate is way above industry average because they trust us to send them genuine offers which are exclusive to them. “The system is simple and easy to use with excellent back office support which is really important when dealing with our staff and customers. It’s also flexible and can move with our business. This is crucial because we want to be aware of our customers’ demands quickly and we need a system that can keep pace with us.